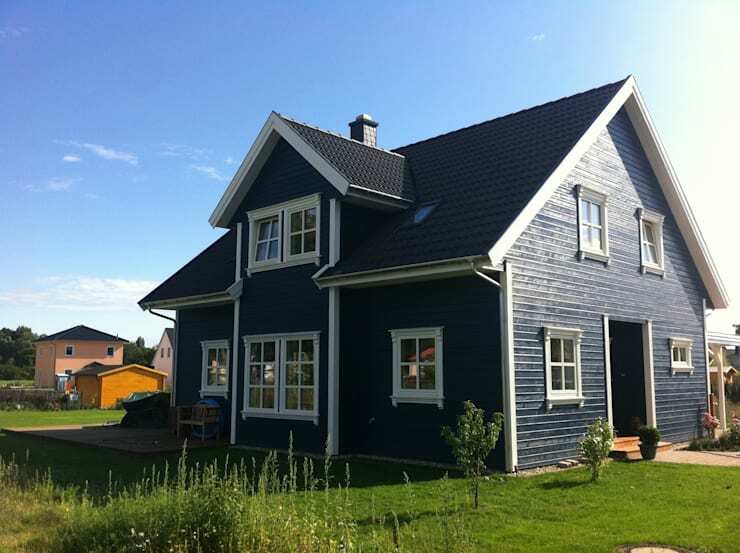 Scandinavian houses have always been unique in style and with its generous use of wood. The wood is a natural raw material that is strong, durable, inexpensive and at the same time, beautiful. 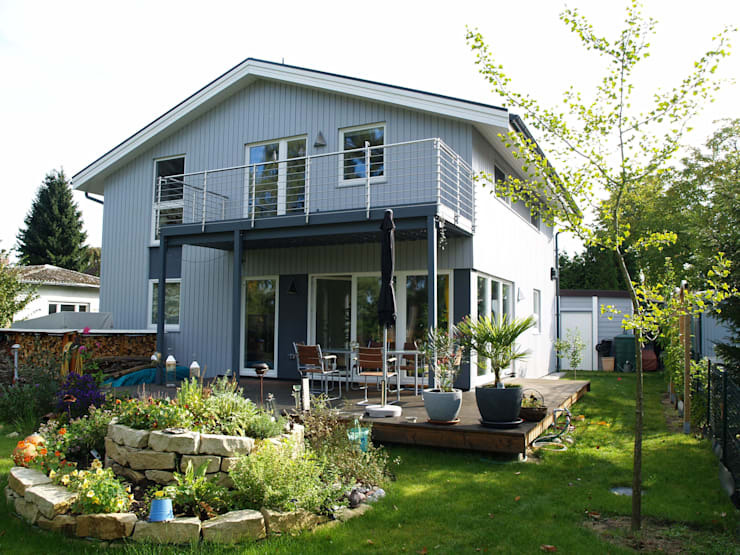 For today’s ideabook, we will take you to beautiful Scandinavian wooden houses you’ll surely fall in love with! For our first model, let’s see a beautiful wooden house in modern style. The house is a two-story home in different shades of blue. On the ground floor you’ll see a matching wooden platform elevating the house, where porch is also in tune with the trees and simple wooden-and-steel tables and chairs. On the upper floor is a small balcony complemented with the white-colored steel bars. Nevertheless, the highlight in this home is the garden in front of the house—the atmosphere is very cool and relaxing! The charm of this house lies the dark shade of midnight blue chosen for the exterior of the house. The house doesn’t look dark either with the white window frames to accentuate it and add variety to the design. This just looks like a beautiful and characteristic country house in the middle of a beautiful green pasture. This kind of house also perfectly fits anyone aiming to build a house along the hill. Gorgeous! 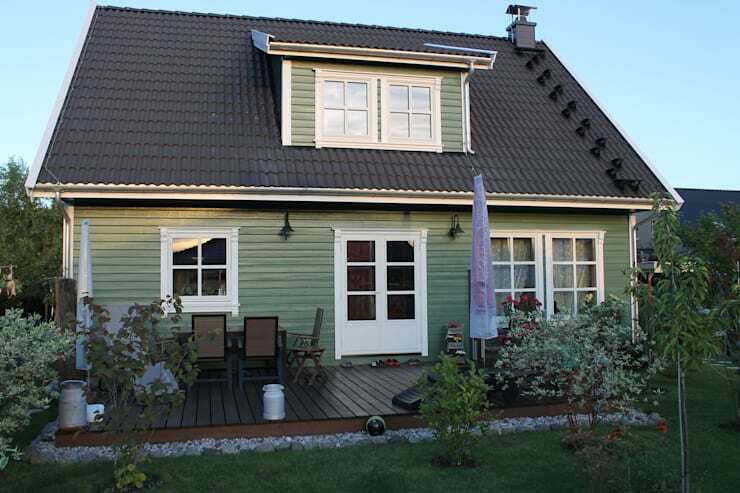 This distinctive Norwegian house in sage green shade is the kind of house you fell in love with at first sight. The house has an area of approximately 112 square meters. There is also a wooden terrace for a relaxing garden view. The architects also added a touch of white stones to the edge of the terrace to even enhance the overall look. The atmosphere becomes even more refreshing and comforting with the planted trees around. Now this house is just like one of those you see in the western movies! Every day would be like a happy holiday, no less! 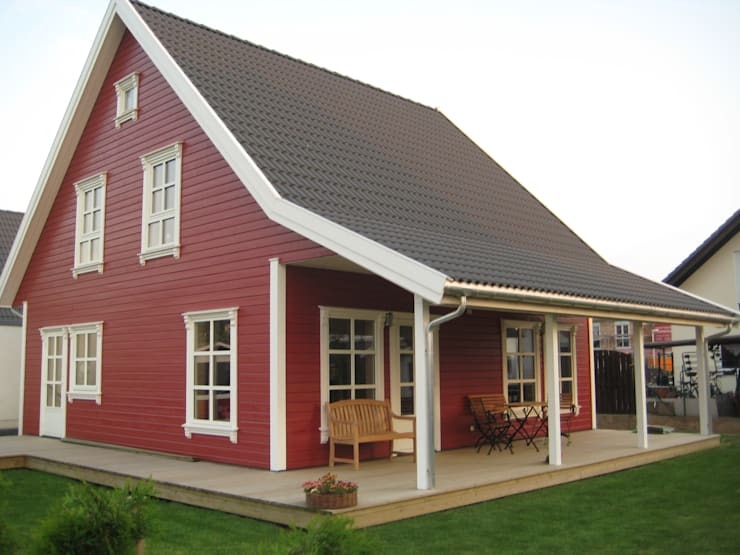 Let's take a look at this house that just looks outstanding, with the whole house in the colors of berry red. One thing to note though, the color tone used for the color red isn’t very bright at all like for example the ‘crimson red’, which usually gives a too intense mood. To matched the dark shade of the interiors, white window frames are also used here which adds differentiation. The house also has a high ceiling and at the same time has multiple windows, which for sure will give the home owners a cool atmosphere with much room for the fresh breeze to enter! The area of this house is 128 square meters, a good size house suitable for middle family. 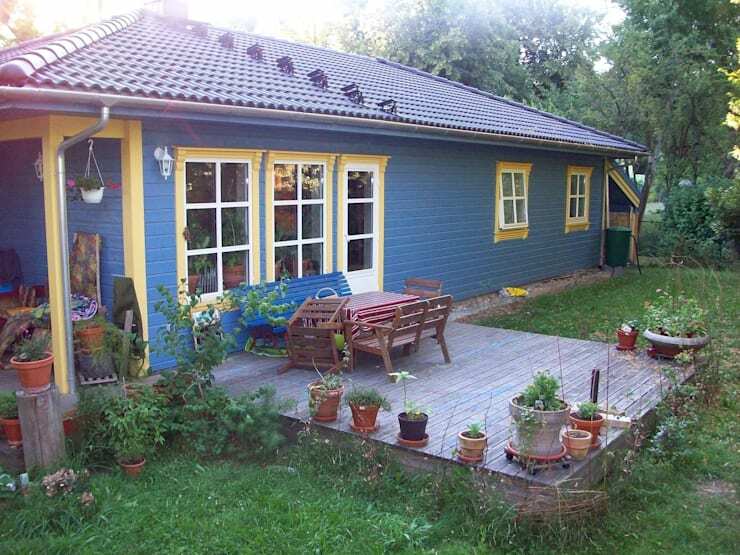 Let's end this ideabook with a scaled farmhouse idea of about 95 square meters. Generally, this house is a blue one, paired with white and yellow window frames. The white and yellow window frames gives a bright and cool vibe to the medium dark tone of the color sapphire blue. Small potted plants trace the corners of the wooden terrace contributing to the design. A porch area can also be added with simple wooden chairs and tables encouraging a good atmosphere for an afternoon picnic with the whole family or with your friends! To utilize available space, one can also have a mini garden or a backyard garden to make your house even more relaxing and to have a healthier environment; while the remaining space behind the house can be allotted for the equipment used in gardening. Such a lovely country house for you to own!